There are approximately 2,000 types of stainless steel that are regularly manufactured. Understanding why the aforementioned these types are used for banding is very important. Especially the most popular stainless steel 304 and 201. 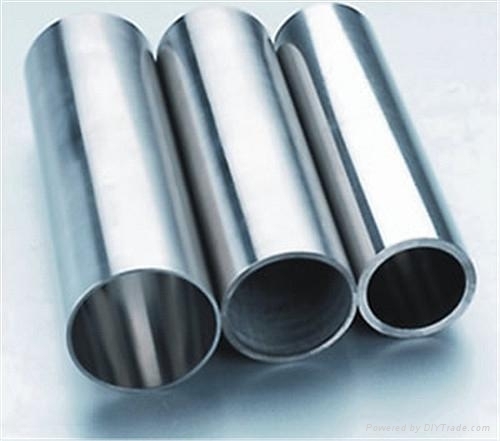 By the situatition of the continuously rising prices of nickel, stainless steel products which contained low nickel content, low prices is really attractive. And the 201 stainless steel is a suitable choice. Grade of 201 stainless steel is gaining large of market, where 304 stainless steel and 301 stainless steel are the main choice. 201 stainless steel has a low and stable prices cause it uses Magan alternative to Nickel. So, it makes 201 stainless steel has many similar properties and characteristic as 304 stainless steel and has an appearance as same as 304 stainless steel appearance. The stainless steel is a type of steel that contains more than 11% chrome, so stainless steel has a film self-protect against corrosion. Nickel also known as the main factor to bring stability to the Austenitic phase and capable of easy processing to stainless steel. 304 stainless steel has a minimum content of Nickel of 8%. In elements which formed to Austenitc, there are many elements can substitute for Nickel to create resistance to corrosion. For example: Chrome (Chrome is the main elements that makes corrosion resistance of stainless steel), Manganese (also contributes to stable Austenitic phase), Nitrogen also contribute to hardness, Copper (Cu) also contributed to Austenitic phase stability. With this composition as above have reduce the raw cost material to produce a 201 stainless steel. This is a first advantage of 201 stainless steel. 2. Durability and capable processing of 201 stainless steel. When we compare the chemical content of 201 stainless steel and 304 stainless steel show the lower Chrome in 201 stainless steel than 304 stainless steel is about 2%. This makes the corrosion resitance of 201 stainless steel is lower than 304 stainless steel. Surface pitting resistance is determined mainly by Chrome elements and Sulfur (S). Chromium makes stainless steel more resistant to corrosion, while the Sulfur reduces the resistance of corrosion. In chemical content, 2 kind of Stainless Steel has the same rate of Sulfur element. 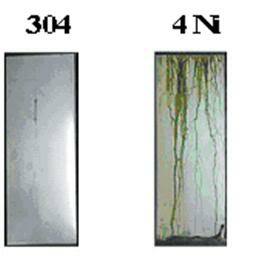 So pitting resistance on the surface of 201 stainless steel is lower than 304 stainless steel. This image is the result of spray salt water through 575 hours. This dis-advantage makes 201 stainless steel should never in use maritime industry.